….the World beyond your Home…. It was the wedding night of Ram Kumar Negi and Jyothi. 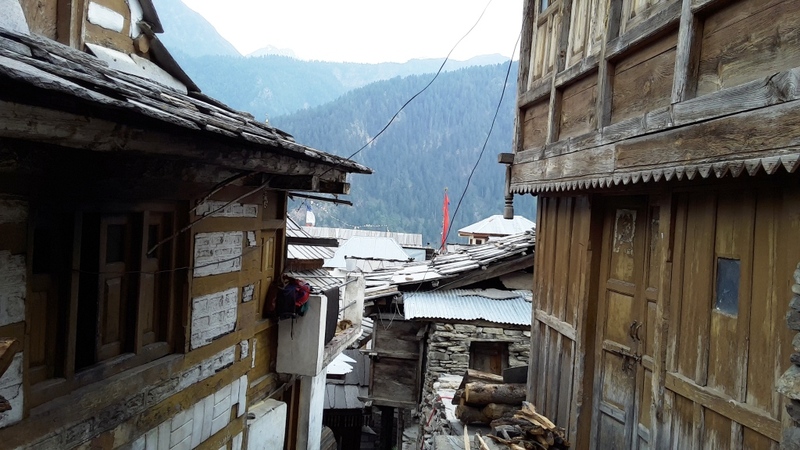 Ram’s green Kinnauri topi was hanging beside the closed wooden dwarang (door) of their humble two storied hut in the village of Rakchham in Kinnaur. Their beautiful wooden hut was today neatly decorated with Bijli lamps. It was also the wedding day of Ram’s two younger brothers Shyam Kumar and Mohan Kumar. But surprisingly none of them would be having the opportunity to enjoy the bliss of their first conjugal night. Earlier in the late evening after the Biyoshimig ceremony (when the bride adieus good bye to her parents and relatives), they had to remain satisfied by wishing their newly wed wife (Naar) Jyothi with the gifts (Rinchot) they had purchased for her and their in-laws (Bitho Pono) way back from Shimla during their visit to the state capital last month. Today the three brothers had married Jyothi according to the traditional Kinnauri custom. The colourful marriage ceremony (Belding Sarmu) had drawn every villager and their relatives from nearby villages to join the grand celebration dance and feast held at the village compound……. 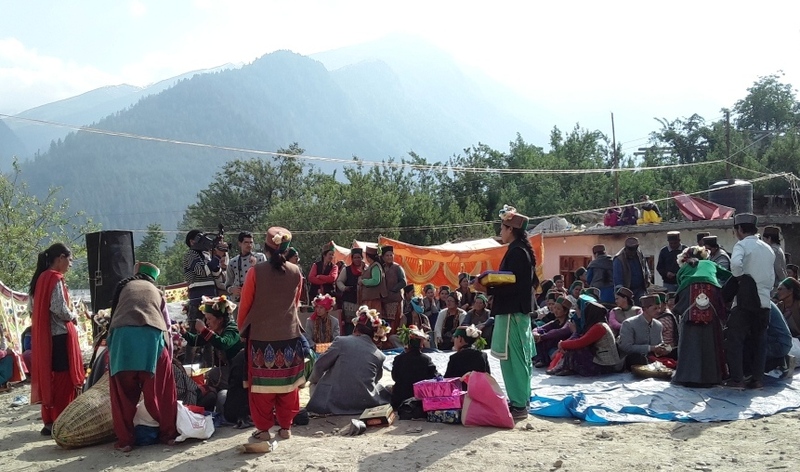 We were lucky to breifly witness a marriage ceremony (Belding Sarmu) of three brothers in a village of Sangla on our trip back from Chitkul. 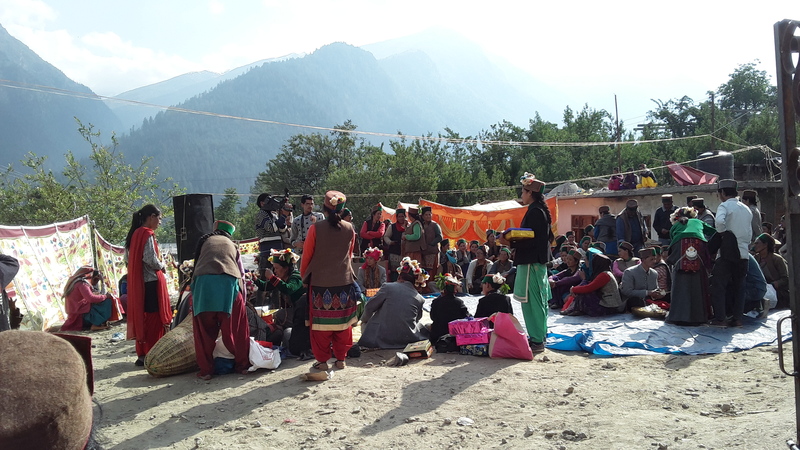 All the villagers assembled here were colorfully dressed in traditional Kinnauri attires. The grooms and the bride (Khatuch) were looking bright. Probably their marriage was already over and it was the time for them to interact with family members and the invitees. Members of the grooms’ family were offering garlands made of “Chilgoja” & dry fruits and other gifts (Bitho Pono) to the bride’s family. A feast was going on under a small tent and two middle-aged ladies were arranging the gift items received from the relatives and invitees. We came to know that earlier in the day, the “Belding Sarmu” ceremony started with a procession made by the grooms to the bride’s house where all the relatives and invitees performed the traditional dance Nati and Bonyungchu. The procession was then accompanied by members of both the families to a village temple (Dyorang) for performing Pujas and completing religious rituals. 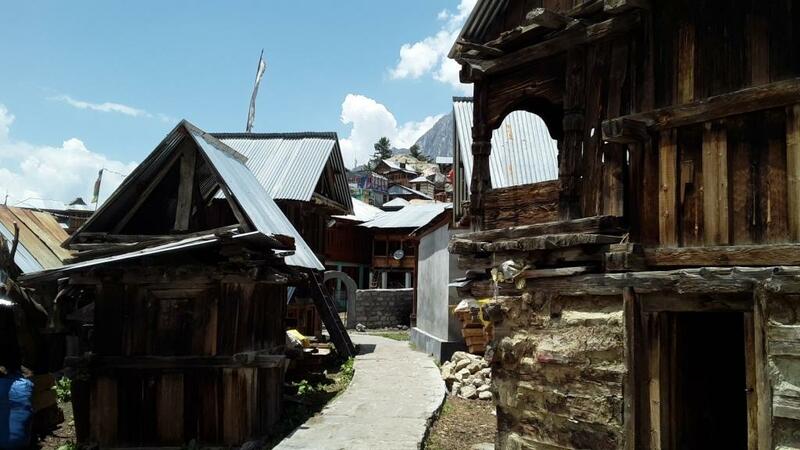 Village life in Kinnaur is perhaps the symbol of down to the earth simplicity and leading the most humble form of living. Although, nowadays you may find Dish TV antennas even in huts. But that is the only form of common entertainment enjoyed by the people. 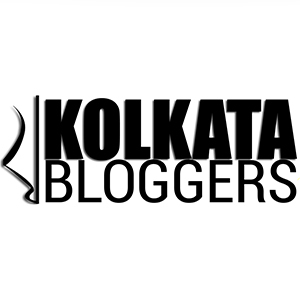 Bollywood bluckbusters are viewed only on the small screens at home. 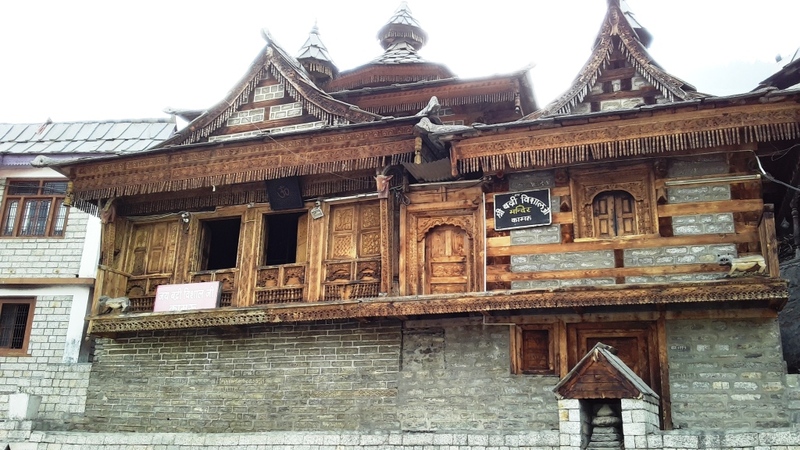 Thereare no movie halls, theatres or shopping malls even in Reckong Peo – the district head quarter of Kinnaur. 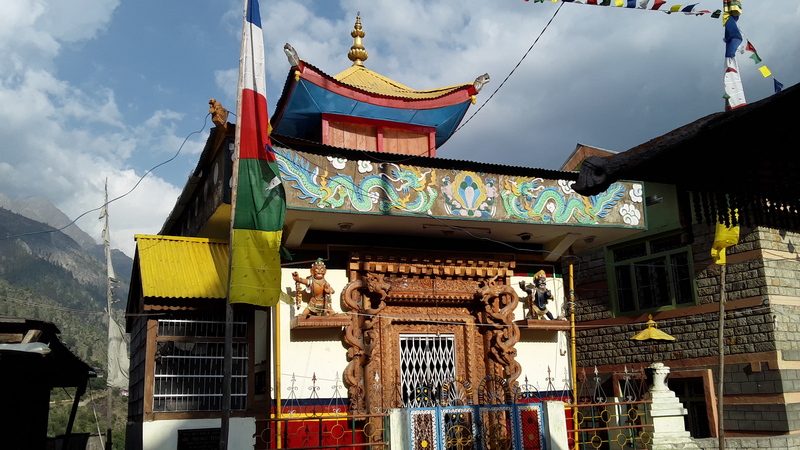 Most of the villages are built around a central Hindu temple (Dyorang) or Buddhist shrine (Donkten/Mane) with probably the richer having their mansions in the centre of the villages and the poorer on the exterior. There are clear cut distinctions in the shapes and making of the Kims (houses) with the richer living in “Pucca” (brick & mortar) mansions with colourful tinned roofs. The poorer lived in traditional Kinnauri wooden huts having roofs thatched by slate tiles. Every house of a Kinnauri village had a huge store housing loads of woods (sheeng) for the harsh winters. The central square of a village, apart from the temples and Buddhist shrines (Donktens/Mane) also housed a relatively large gallery meant for religious activities and major social functions. 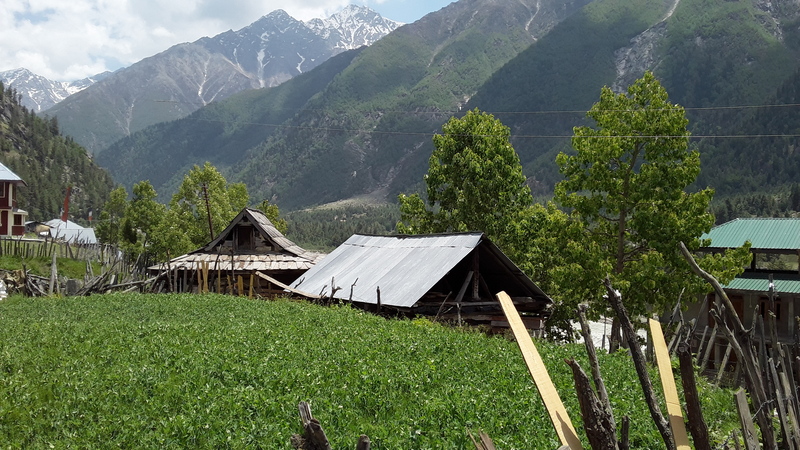 Villagers during the summer months grew potato, turnip and cabbage in the form of small cultivable step lands curved out of the mountain slopes or beside the basin of the Baspa river. 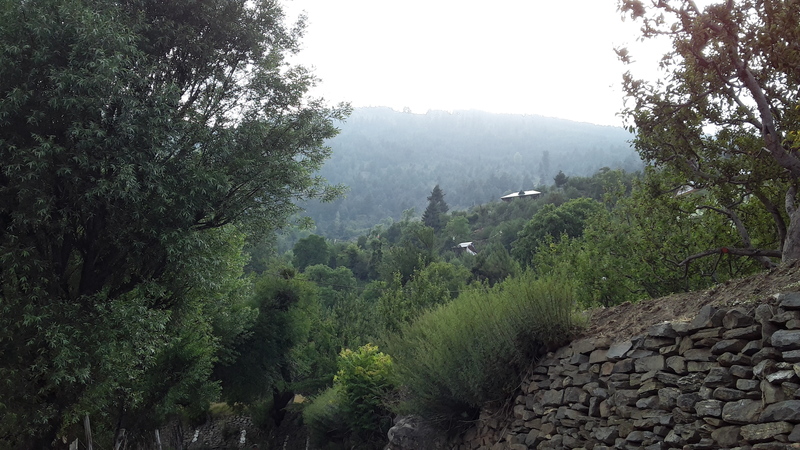 Every farm land in Kinnaur featured a small farm house commonly known as “Dogri” which is generally located far away from the main village. 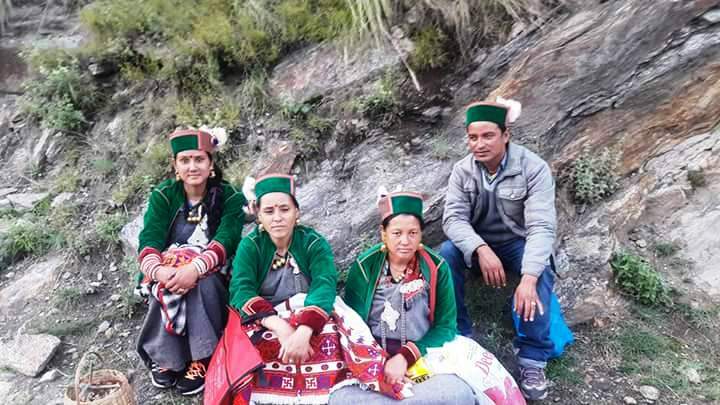 People of Kinnaur can be easily distinguished from other people of the Himachal not only by the marked difference in their looks, but also in their unique traditional attire. 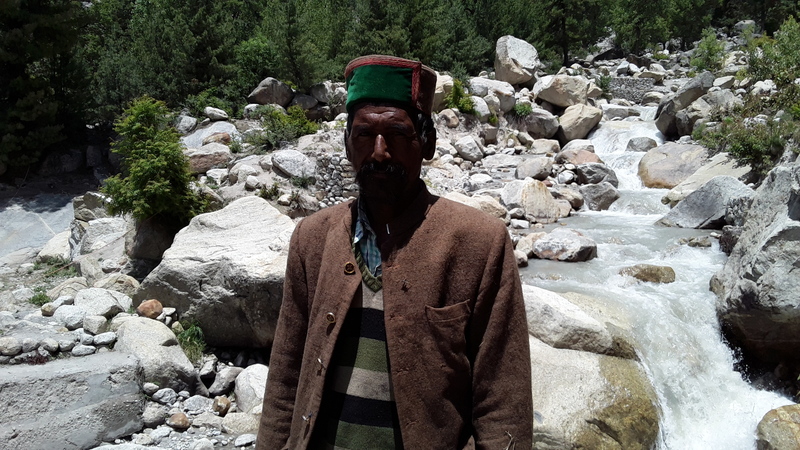 The green Kinnauri topi (Cap) is a must for every man and woman in Kinnaur. Men and women wear chamu sutan (i.e. long woollen trousers) with Gachhang (a piece of cloth) tied round their waists (like a belt), chamu kurtis (woollen shirts), chamu baskat (woollen waist coat) and Chuba coats giving them an unique look. Ladies frequently wear the local shalwar kameez suits, Chuba coats and ghoye (small woollen shawls). Although the younger generation prefer to wear shirts, jeans, trousers, kurtas and shirts of an average Indian, but the traditional uniform is a must during all religious festivals and social functions. Religion is of great influence and importance in the life of every Kinnauri. Alienation, helplessness under the forces of harsh nature, lack of amenities and modernization had creeped the influence of superstitions, rituals for evading dark forces in many of the social customs and traditions. Initially many of the tribal clans worhsipped the forces of the nature as Demi Gods – in the form of river gods, tree gods, snow gods, house gods and so on. Hindu Kinnauris were worshippers of Lord Vishnu, Shiva, Indra, Devi Chandika (Durga). 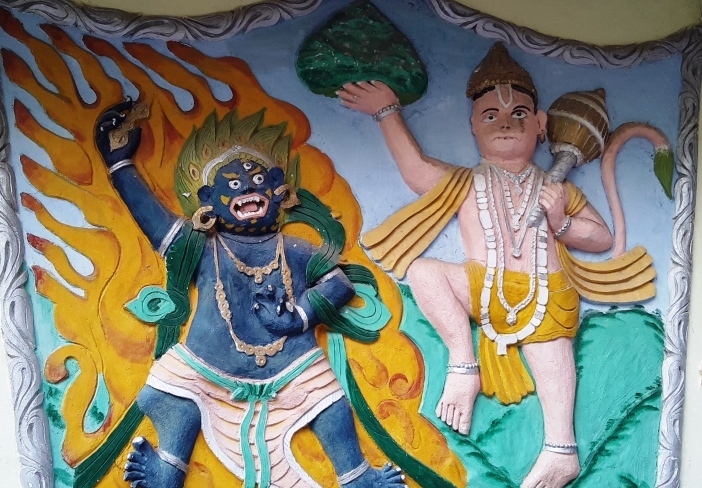 The uniqueness of the Kinnauri religion is that inspite of all the known Gods (Deotas) each village had a deity or more than one deities of their own like (Devi Chandika in Kalpa, Devi Kamru in the Kamru village) to protect their villages from evil forces. The people of Kinnaur at the same time are ardent followers of Buddhism. The influence of Buddhism in Kinnaur had been mainly influenced from Tibet. 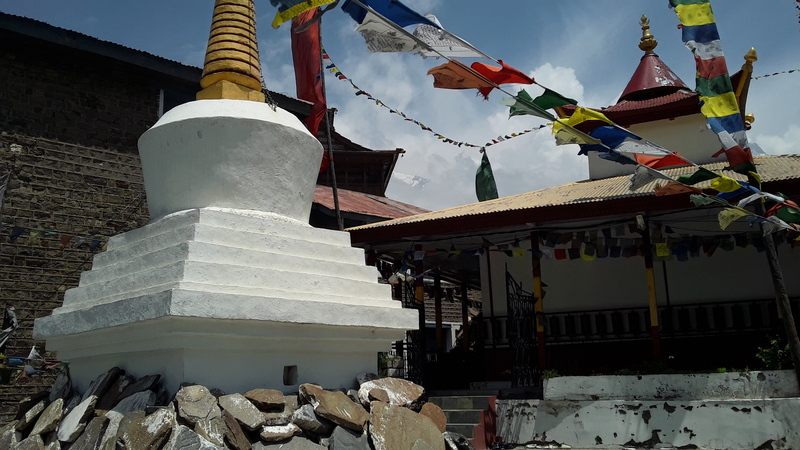 The Buddhist culture is believed to have been carried down from Upper Kinnaur villages (near to the Tibet Border) like Nako, Tabo and other Gomphas (larger Gomphas known as “labrang”; smaller ones known as “lakhang”) by the Rin-chen-bZang-pos (Head of the Buddhist shrines). 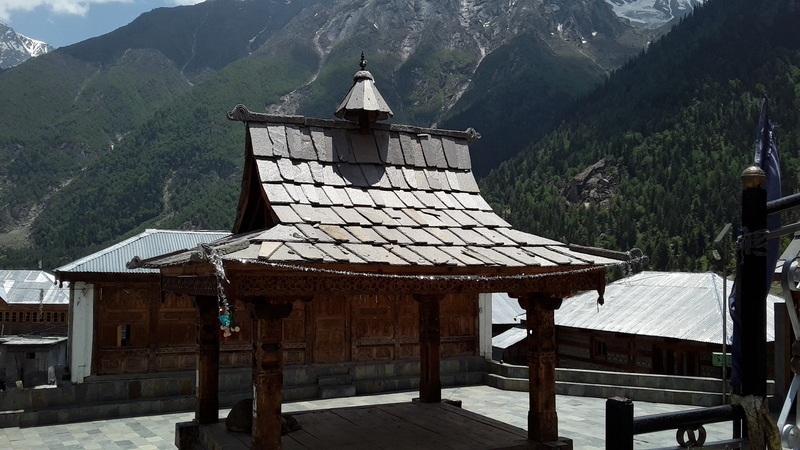 When we toured many villages in and around Sangla, Chitkul and Kalpa we were surprised to observe the dualism of both Hindu and Buddhist religious beliefs adored by the natives. Land is the most vaulable asset in the life of any Kinnauri. 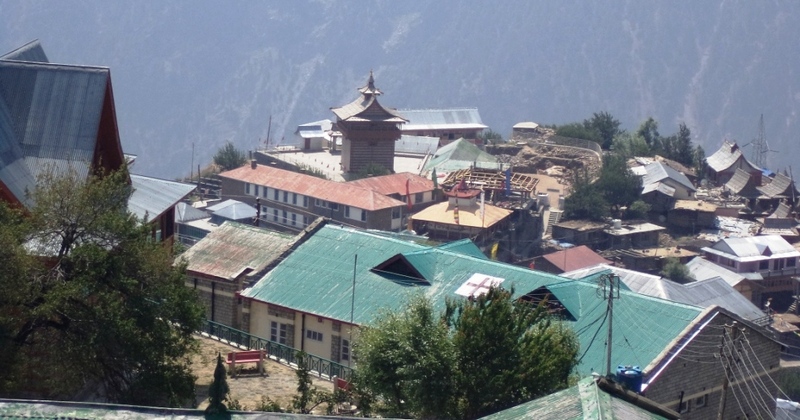 Any economic activity or occupation in Kinnaur is associated with land. 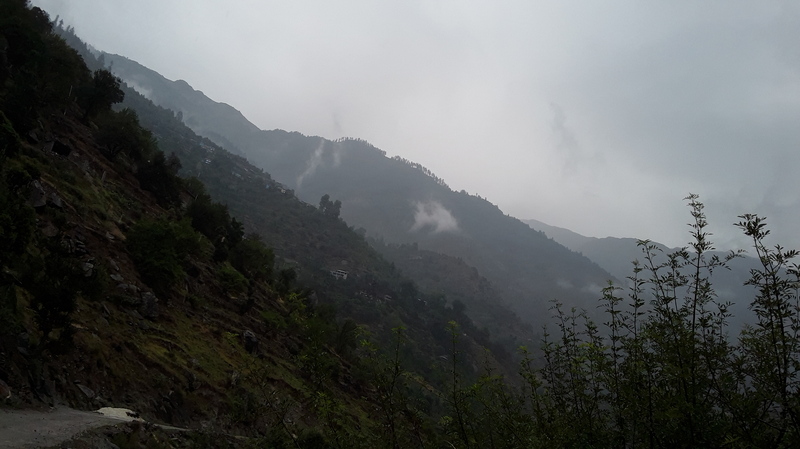 Land is used for apple, cherry, khubani and chilgoja orchards – which are the major cash crops in Kinnaur. Other cultivable lands are used for growing varieties of rajma (kidney beans), potato, turnips and cabbages. Occupation of a Kinnauri villager is typically spun around their land. Every family member, even the ladies are associated with managing and maintaining their orchards and growing crops needed for their day to day living. Marital alliances are decided on the basis of possessions of land and properties. According to the Kinnauri land law “Wazibul-Arz” in any marital alliance, the grooms are compelled to allocate portions of their ancestral land in the name of their to be bride before going in for the marital alliance. 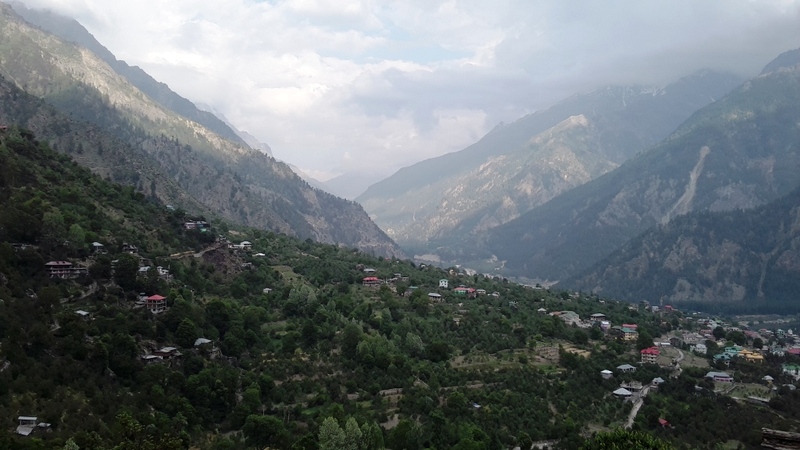 As the major source of economy in the region is based on growing cash crops and apple orchards – land is considered to be important for all economic activities in Kinnaur. Most of the socio-economic activities and occupations are based on managing the apple orchards and cultivating the cash crops. 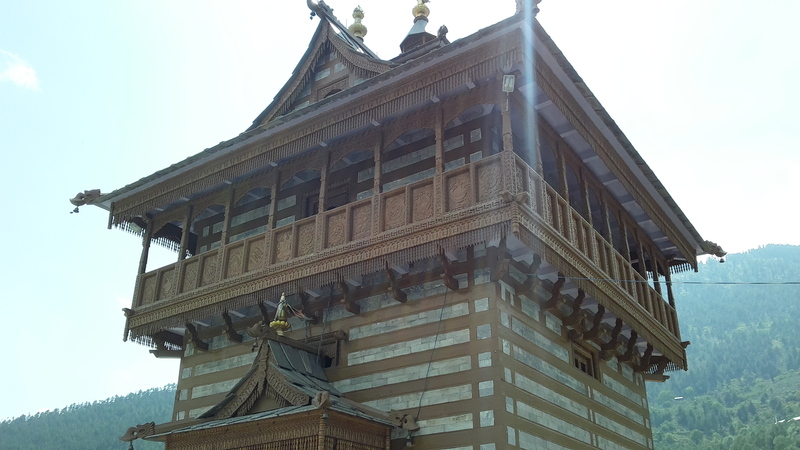 Tourism on the other hand, as compared to other parts of the Himachal had been strictly seasonal and restricted to the summer months of June to mid September. 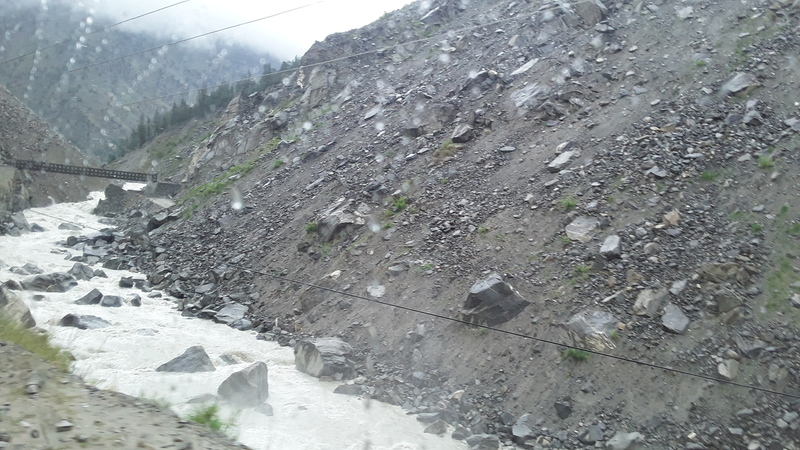 According to our tour guide Mr. Mukesh Negi, “Sir Ji, we can hardly depend on our earnings from tourism! Winters of Kinnaur are long and harsh. We cannot work in those four months. The rest of the months (May to late October) we need to simply work hard on our lands to yield quality apple and other fruits that could be sold in reasonably high prices in the markets of Shimla, Punjab and Delhi. My wife is a Government School teacher and even her job is not enough to manage the family when we don’t work in the winter.” When we asked him about Polyandry, he said that, he and the other youth of Kinnaur are slowly getting out of these primitive rituals and traditions. Probably having education in the state capital and in other states in and around Himachal had influenced the youth of Kinnaur to adore the entrepreneurial perspective as a more effective way of surving and maintaining a decent way of living. 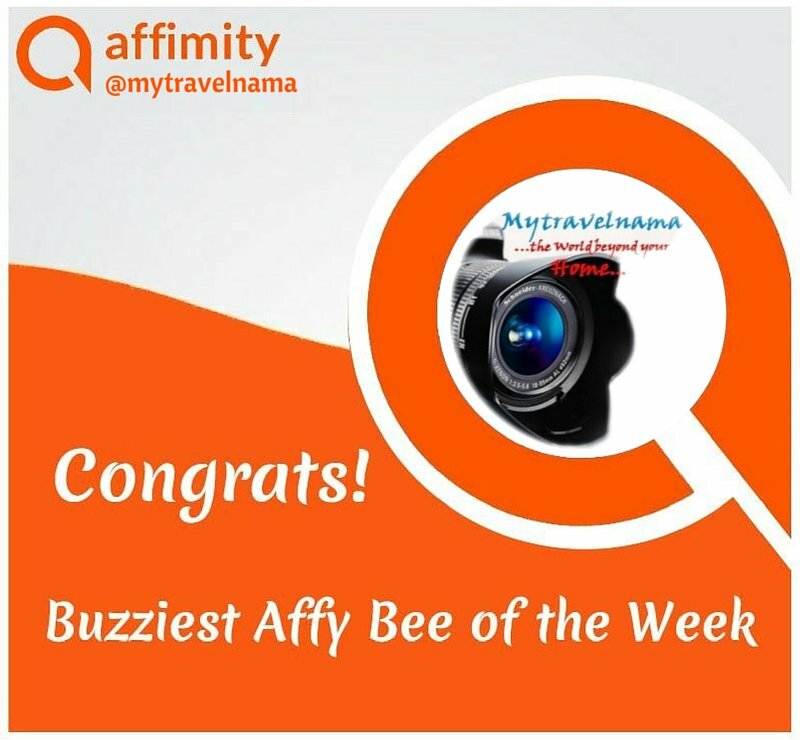 He himself had started his own venture related to tourism providing tour and trekking guidance, SUV rental and hotel/resort booking for the visitors in Kinnaur. 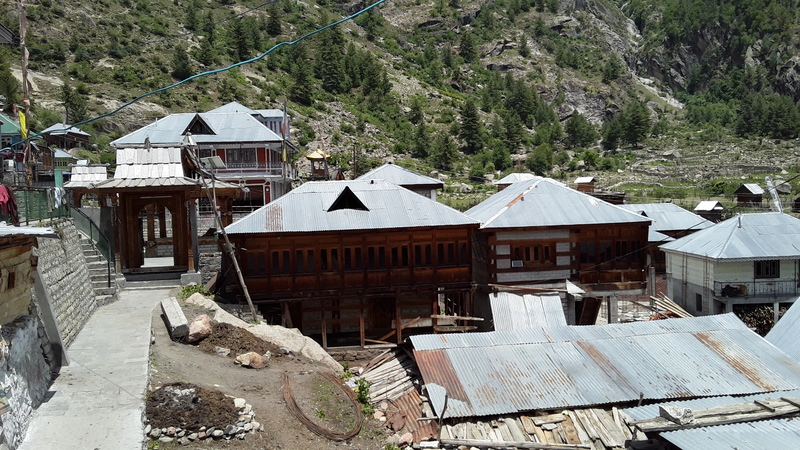 Many of the youth had ventured into hotelling, merchandizing and private transport businesses at major towns like Reckong Peo, Kalpa and Sangla. Kinnaur as a land had been mostly unknown to the rest of the Nation before the Indo-China Conflict in the year 1962. With the Chinese aggression, the Government had taken the timely decision to link the virgin lands of Kinnaur with the rest of the country through the Indo-Tibet border highway or the present NH 5. 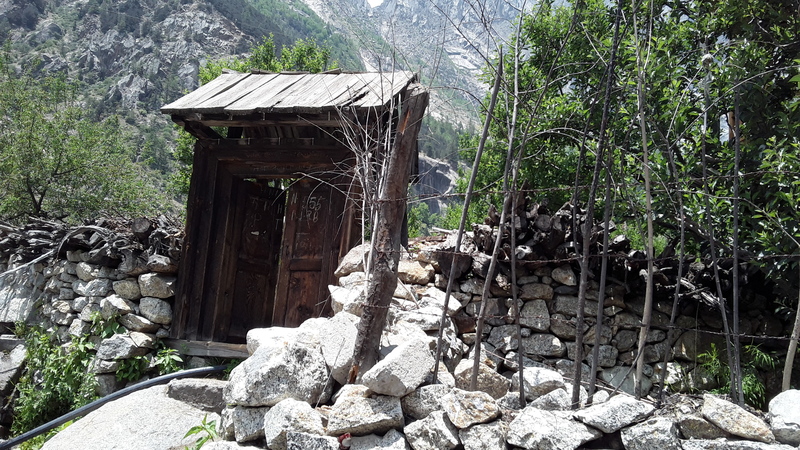 Before this Kinnaur had been long alienated from having any basic civic facilities and supply of resources necessary for upgrading the lifestyle of the villagers. 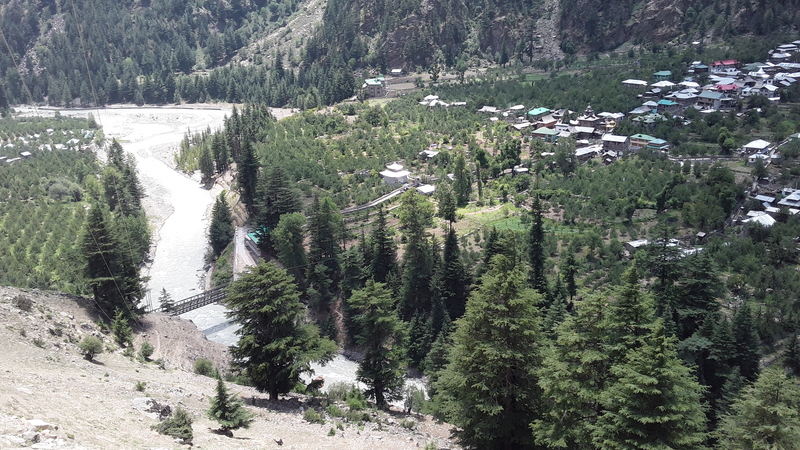 As years passed by Kinnaur was gradually looked upon as an attractive tourist destination and a major source of cash churning from the numerous hydel projects built around the Sutlej river basin. Yet inspite of these changes the hardship of an average Kinnauri still remained the same due to adverse conditions of the nature and frequent natural calamities. 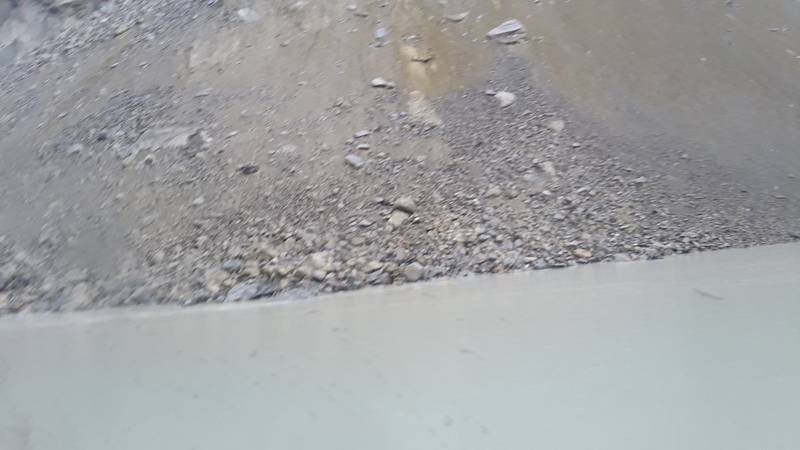 Most of the villagers condemned the brutal destruction of natural resources, mountains and the river basins of the Sultlej and the Baspa rivers by the power plant tunnelling sharks which not only endangered the very ecological balance of the region but had also brought in unexpected natural disasters in the form of flash floods, cloud bursts and incessant landslides leading to the massive loss of private and public property in Kinnaur. Today “Chilgoja” (pine nut) trees once naturally abundant in the mountain slopes and the very existence of fishes in the waters of Baspa and Sutlej are on the verge of extinction in Kinnaur. The slow but the obvious death and decay of the nature can’t be ignored at the cost of civilization before it is too late for all of us. Our Kalpa-Kinnaur tour was an experience of a lifetime. 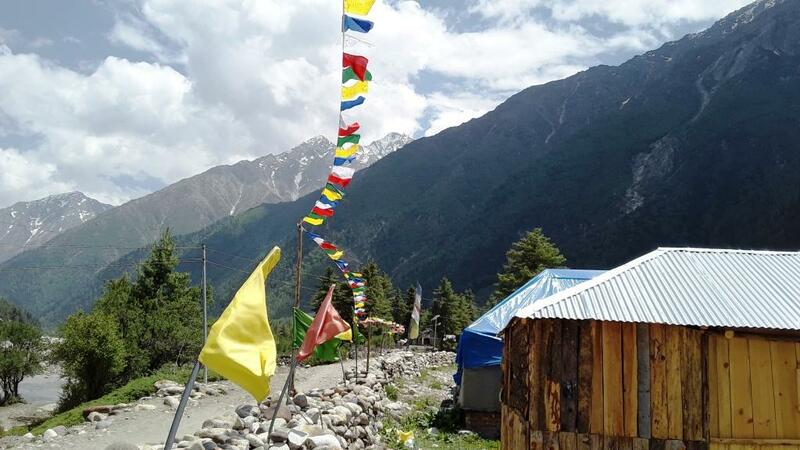 We had to admit that Kinnaur is a land of virgin natural beauty. People of this land are different from the known world in their tastes, preferences, behaviour, religion, beliefs, values, social customs and traditions. Mysteries of the “unknown” loomed in and around every corner of this amazing haven hidden by the walls of the mighty Himalayas. There was no other way for us, rather than to remain awestruck by the sheer magnitude of the secret shades of life and the nature in Kinnaur…. 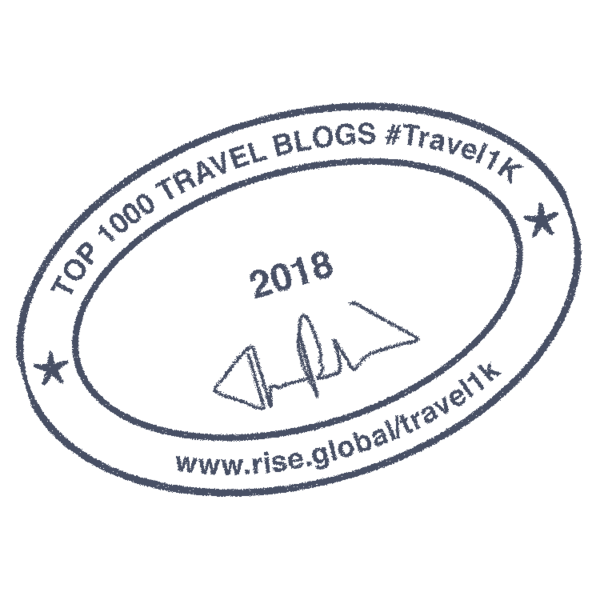 Nice blog, good writing also ! Informative and compelling, I really enjoyed this. That’s very interesting. 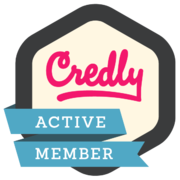 It will be very useful too for people to get a holistic view and overall hang of the place. Wish you the very best. Excellent coverage of lifestyle, customs, topography, environment and socio economic features of Kinnaur. Very informative write-up and wonderful pictures to adorn it. I’ve read about the polyandry custom in this tribe; I think, you have rightly pointed out the reasons behind it. Very interesting.Thank you for sharing this. Interesting information. Comprehensive coverage. This gives a complete picture of not only the headline grabbing polyandry but the ecological destruction impacting the lives and livelihood of the people.